As a devoted father and family man, you know the importance of children. Our beloved eldest child, Madeleine, was abducted from Praia da Luz, Portugal, four years ago. Since then, we have devoted all our energies to ensuring her safe return. Today we are asking you - and the British and Portuguese governments - to help find Madeleine and bring her back to her loving family. We live in hope that Madeleine will be found alive and returned to us. One call might be all that is needed to lead to Madeleine and her abductor. To this end, we are seeking a joint INDEPENDENT, TRANSPARENT and COMPREHENSIVE review of ALL information held in relation to Madeleine's disappearance. Thus far, there has been NO formal review of the material held by the police authorities - which is routine practice in most major unsolved crimes. It is not right that a young vulnerable British citizen has essentially been given up on. This remains an unsolved case of a missing child. Children are our most precious gift. Please don't give up on Madeleine. Thank you for your heartfelt and moving letter. Your ordeal is every parent's worst nightmare and my heart goes out to you both. I simply cannot imagine the pain you must have experienced over these four agonising years, and the strength and determination you have both shown throughout is remarkable. I am acutely aware of the frustration you must feel as more time goes by and yet no news is forthcoming. We discussed this when we met, but I realise that a further eighteen months have gone by since then. That you have been so courageous over all this time, and have not given up, speaks volumes. I have asked the Home Secretary to look into what more the Government could do to help Madeleine. She will be writing to you today, setting out new action involving the Metropolitan Police Service which we hope will help boost efforts in the search for Madeleine. I sincerely hope this fresh approach will provide the investigation with the new momentum that it needs. I know that everyone hopes and prays for a successful outcome, and our thoughts remain with you and your family. We will, of course, stay in close touch with you throughout. "Following discussions between our Ambassador in Lisbon and the Portuguese Judicial Police, the Government received an offer of co-operation with the police here." Quel ambassadeur britannique à Lisbonne ? Le Royaume-Uni n'a actuellement aucun ambassadeur au Portugal, le dernier étant Alexander Ellis, qui en est parti à la fin de 2010. En janvier, le FO a annoncé la nomination de Joanna O'Sullivan comme "chargée d'affaires" en attendant qu'un nouvel ambassadeur soit désigné. En février, le FO a annoncé que Jill Gallard avait été nommée, mais elle n'entrera en fonction qu'en juillet 2011. Le porte-parole du HO n'a pu s'exprimer davantage sur cette sorte de détail : 4Nous ne voulons pas être impliqués dans la question du qui a rencontré qui et quand. De son côté, le Ministère public déclare que ni le bureau du procureur de la république, ni les autorités concernées n'ont reçu de requête de coopération ou de ré-ouverture du dossier. David Cameron has instructed the Metropolitan Police to review the case of Madeleine McCann. This is in response to an open letter in The Sun and is entirely predictable in terms of the "pulling power" of News International on Government policy. "The operational independence of the police service, and the decisions made by its operational leadership remain reserved to the Office of Chief Constable and that Office alone. 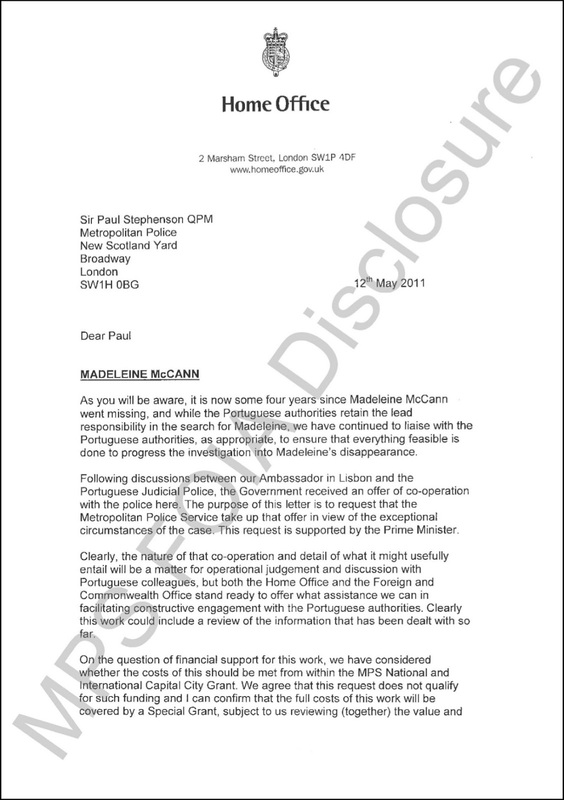 "Whilst no-one doubts the desirability of doing what can sensibly be done to find out what has happened to Madeleine McCann, I can imagine that the senior leadership of the Metropolitan Police are not exactly happy about this. It again embroils their officers in a high profile investigation, where the chances of success are unclear, and which will divert limited investigative resources away from other matters. Note : Headline later amended from 'review Madeleine McCann's death' to 'review the Madeleine McCann case'. 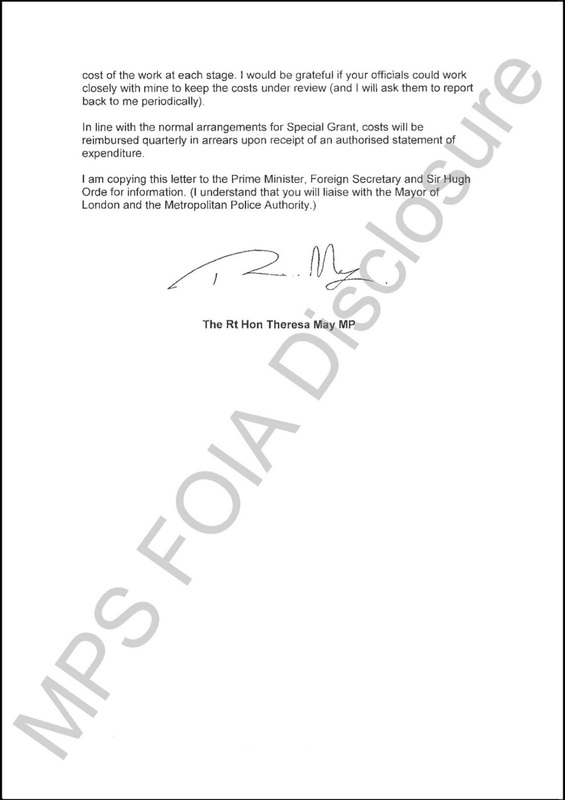 The Prime Minister's instruction to the Metropolitan Police to review the Madeleine McCann case is in breach of the draft protocol that is supposed to protect the operational independence of the police. The Metropolitan Police Authority meets tomorrow at City Hall for the first time since the Prime Minister instructed/encouraged/invited/asked the Commissioner to consider a review of the Madeleine McCann case. And outside there will be a vigil to remember all missing children attended by relatives and campaigners. Several MPA members (including Jenny Jones AM and Jennette Arnold AM) have already announced they will be joining them. 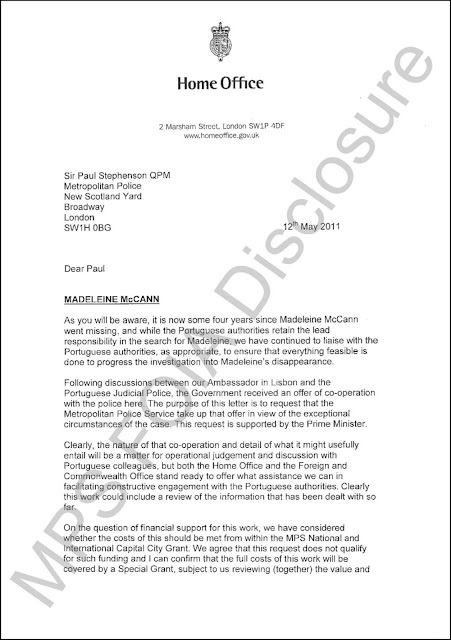 I am sure that those campaigners and relatives will be asking whether the cases in which they are concerned can be reviewed by the Metropolitan Police in the same way that the Madeleine McCann case is to be. And this is hardly surprising. The Commissioner will no doubt tonight be polishing up his answers as to why he made the operational decision (without being pressurised by a politician, of course) that the McCann case should be reviewed and whether the same factors will apply to the other cases. He will also no doubt remind the Authority that the Home Office has offered to pay for the costs of the investigation. This is, I am sure, a welcome contribution to the Met’s budget, but will this cover only the additional costs of the investigation or will it cover the costs of the salaries of the detectives engaged in the review and, if so, where will the replacement detectives be found to cover the work that those detectives would otherwise have done? And was this offer of financial assistance a factor in the operational decision that the Commissioner made to have this review? And, if it was a factor, does the offer to pay guarantee anyone else a Metropolitan Police case review? Might be a nice little earner. I am sure the Commissioner has also given thought to what will happen after the review has been concluded. Will the review be shared with the McCann’s? And, if not, what is the purpose of the review? I am confident that all will be made clear tomorrow.